Do you have repeatable and predictable actions to apply to your massive photo collection? Actions like: resizing, converting, cropping, watermarking, date stamping, renaming, and so on? Since 2005 we've been working to make BatchPhoto the best tool for automating those repeatable actions! BatchPhoto isn’t a precise tool, like the infinitely challenging Photoshop is. But, it doesn’t try to be. Rather, it excels at being a tool for performing actions that are both repeatable and predictable. Actions like resizing images and changing tones and hues, or watermarking photos. See the complete list of features. 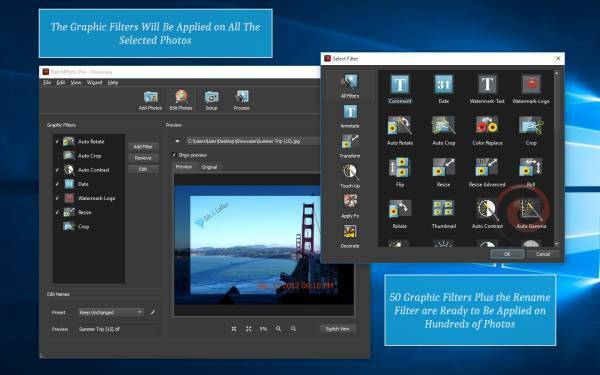 Edit thousands of pictures in one operation with support for multi-core CPUs! Watch folders for new or updated images and automatically apply a custom set of edits. 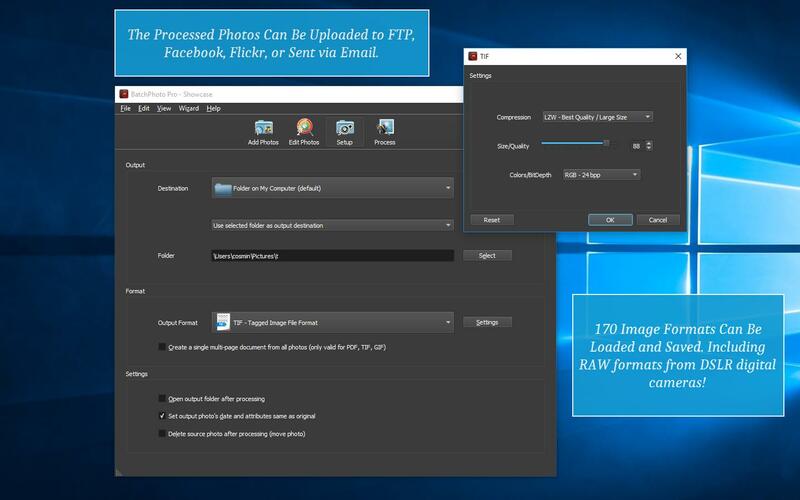 Read and save 170+ image formats, including: JPG, TIF, PNG, GIF, PDF. Read all RAW image formats generated by almost all DSLR digital cameras. Give meaningful names to your images instead of the default cryptic names. 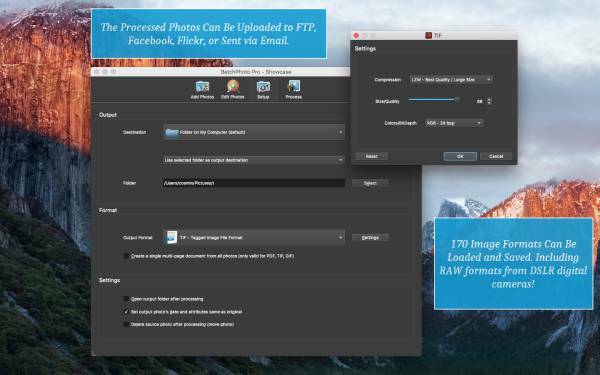 Edit your photos then directly upload them to FTP, Facebook, or Flickr. Date stamp photos in bulk with their original date/time as taken from the EXIF record. 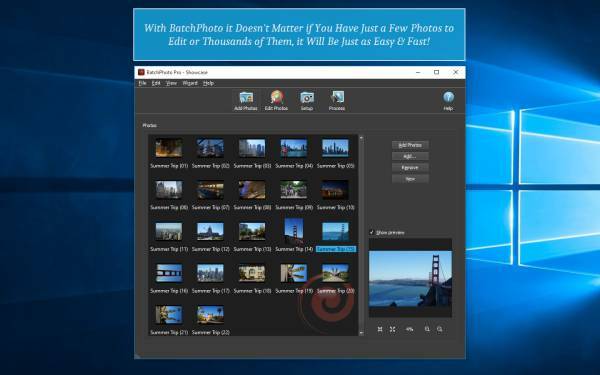 Automatically cut hundreds of photos to a predefined aspect ratio or custom rectangle. Change image sizes in bulk for easy sharing or to save space. Visually watermark images with logos and texts in bulk. 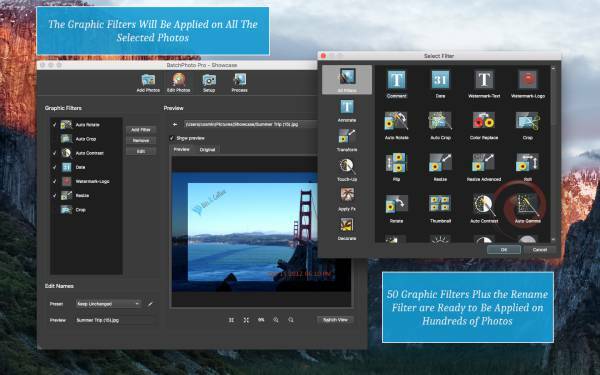 Edit photos in bulk with filters like: Auto Contrast, Auto Gamma, Sharpen, Brightness. Apply graphical effects to photos in bulk, effects like: Sepia, B&W, Charcoal, Oil Paint. Edit pictures in bulk by following a three-step wizard! But why not try for free the fully-featured trial version of BatchPhoto? Just click on the "Try Free" button below! The free online & mobile version of BatchPhoto! With Espresso you can: convert, resize, crop, rotate, touch-up or apply effects on images for free from your mobile or desktop web browser. BatchPhoto 4.3 has been released! 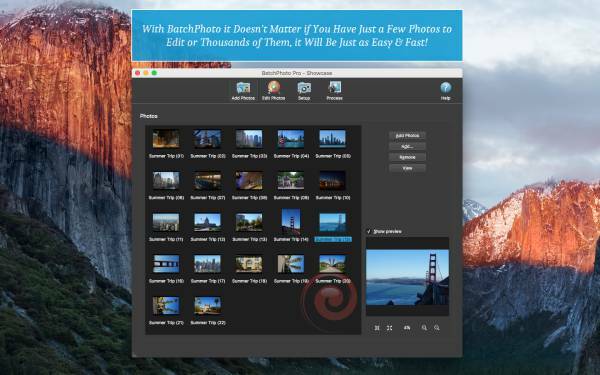 BatchPhoto Espresso, the free online & mobile version of BatchPhoto has been released! Today, we are introducing a complete web site redesign!